Fernhurst is a rural English village located in the Sussex weald in southern Britain, overlooked by Blackdown Hill (920 ft) and other hills including Telegraph Hill (676 ft), Marley Heights (700 ft), Bexley Hill (600 ft) and Fridays Hill (675 ft). The village lies in the Sussex Downs Area of Outstanding Natural Beauty in the north-west of the county of West Sussex close to the borders of Surrey and Hampshire counties. In 2009 the South Downs National Park, England's ninth national park, was declared, covering 627 square miles of rural Sussex and Hampshire. The Park which stretches for 100 miles from Winchester in the west to Eastbourne in the east incorporates the Western Weald including Fernhurst. The South Downs National Park was officially designated on 31st March 2010. The towns of Haslemere and Midhurst lie to the north and south respectively. Fernhurst Parish has a population of 2,765 (2001 census) and includes the settlements of Fernhurst village, Henley Common, Kingsley Green, Bell Vale and part of Camelsdale. The parish was formerly named Farnhurst. 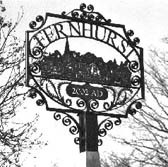 Other alternative spellings of Fernhurst in historical documents include Farnherst, Farnehurst, Fernehurst, Farnest, Fernest, Fernnist, ffarneste, ffarnehurst. visit our links pages, The Fernhurst Portal listing local organisations and other British villages in West Sussex.